These cute accessories are my first finished objects for this year! Yay! I started to crochet these after I finished the Crochet Your Fade -shawl. The Yarn is local yarn brand called Kaupunkilanka. I made all accessories with 3.5 mm hook. The brand is quite new and this is the first time that I use it. I bought few skeins form a local craft fair in November. The yarn has 200m in 100 g. The pink glitter yarn has 71 % wool, 24% polyamid and 5 % polyester. 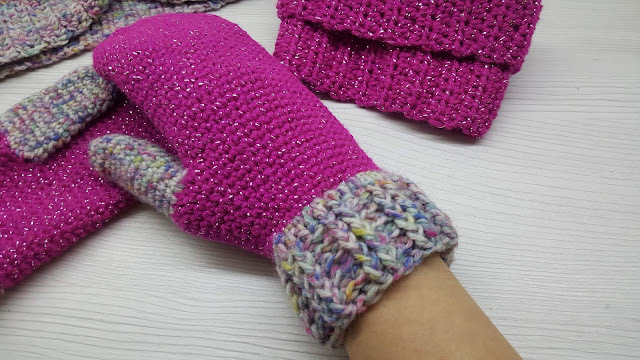 The mittens are made from top down and with single crochet (US) stitch. The rib is made by using front and back post double crochet (US) stitch. The headband and the boot cuffs are made by using half double crochet (US). I really like the glitter pink yarn, it made me dream of a glitter pink cardigan :) I am pleased that the accessories fits quite nicely to my Fade -shawl. I think this is my loveliest shawl ever! Crochet Your Fade ! The amazing designer is Julme Conradie. From IG you can find her by the name @mysquarehat. The shawl pattern can be found from Ravelry. The Roosa Nauha sock yarn is a yarn from a local brand. You can find more information of the yarn from here. I bought the Beehive skein from Yarndale, where I visited in September. My first intention was to crochet the whole shawl with the Roosa Nauha sock yarn, but luckily I realized that I have that Beehive yarn and it fits perfectly to those solid colors. One of my favorite designers is Tatsiana from Lilla Björn blog. When she published this heart pattern, I was totally in love. You can find the pattern from her blog for free and from Ravelry download for small compensation. 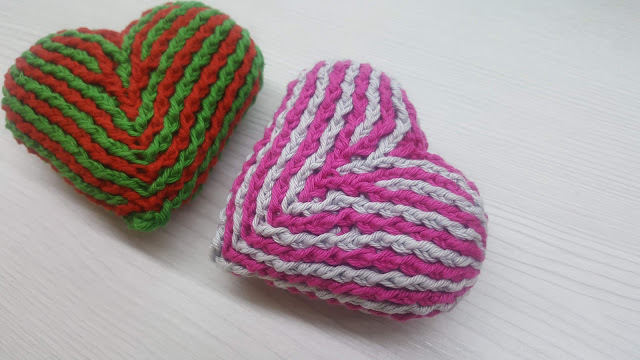 I made the hearts from Catania yarn and with 3 mm hook. The design may look challenging but if you read the instructions carefully and follow them step by step, I promise that you can do that lovely heart. These cuties are, for example, a very good idea for Valentines Day! In this blog I will share my passion and mania for crochet and perhaps some designs of my own.